Terttu Leney is a Finnish teacher, trainer, broadcaster, and writer. She currently works for the Foreign Office in London as a professional development coordinator, preparing British diplomats and businessmen for overseas postings. After graduating in Russian and Swedish language and literature from the School of Slavonic and East European Studies, University of London, Terttu completed a postgraduate diploma in language training at the University of Westminster. 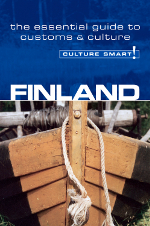 She has written several publications, including Teach Yourself Finnish, Finn Talk 1, and Finn Talk 2. She lives in London with her English husband and family.